PEM J60 Series Stub Ups are made from red brass, schedule 40 pipe, a cast bronze base brazed to a conduit, cast bronze, brass and stainless steel fitted ground connection. 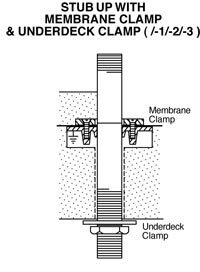 Membrane Clamp base has blind threaded openings for clamp bolts. This is the PEM J60/-1 Conduit Stub Up. This is the PEM J60 Conduit Stub Up shown with the Membrane Clamp and the Underdeck Clamp. You can see a better drawing of this at the bottom of the page. Shown below is the PEM J60 Conduit Stub Up from a more technical viewpoint. 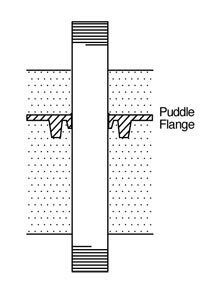 Shown on this drawing are not only the J60/-1 Stub Up, but the /-2 Membrane Clamp Option and the /-3 Underdeck Clamp option. If you've got questions, contact Coastal directly!